Freedom 251 is a revolutionary smart phone by a budding startup company Ringing Bells for just ₹ 251. Even some mobile covers are costlier than this phone and the closest phone which offers features equivalent to this phone cost almost 16 times i.e. ₹ 4100. Ashok Chadda president of Ringing Bells claimed 'economies of scale' business model for such a low price for this phone despite manufacturing cost of ₹ 2500. The height of successful launch event marked by the presence of BJP MP's can be measured through six lakh hits their website received in the first hour of booking. Although the site crashed frequently almost 30000 bookings were registered by the company on first day i.e. 18th February 2016. The company which is new to the business and which have currently no functional manufacturing unit if delivered this phone in four months deadline promised by them than it would not be less than a miracle. Industry experts are suspicious about this phone and termed it impossible to produce a phone in such a low cost even if all parts are manufactured in India. It must be noted that at present parts of mobile are not manufacturing in India and Indian mobile giant Micromax also resourced these parts through foreign partners. 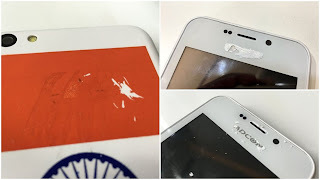 The phone model showed in launch event have whitener hiding name written on front side and the back panel have tricolor printed covering logo of Chinese company ADCOM. Is Ringing Bells trying to sell Chinese phone in garb of Prime Minister Modi's Make In India campaign? The above points raise doubts and forced me to compare this phone launch to 1955, Raj Kapoor - Nargis starring movie Shree 420. In this movie a rich man exploiting the honest image of Raj Kapoor's character offered ₹ 100 permanent homes to the poor. Actually it was his plan to grab poor people's money and then run away with the money blaming Raj Kapoor for the scam. Eventually Raj Kapoor found out the truth and exposed the respected fraud (Shree 420) in front of police and public. The mobile launch event with backing of Narender Modi's flagship Make In India campaign and the public response that follows refreshed memories of that film in my mind. I hope that my doubts and suspicions are only illusion and the company would perfectly deliver smart phone sets to the consumers after four months. The rate of scams, innocence of large population and charm of our people towards large scale advertisements always awake ACP Pradhyuman in me "Kuch To Gadbad Hai"(Something Is Wrong There). Only time will tell the outcome of this scheme till then stay peaceful, informed and patriotic for country. (Not for any party or organization). God Bless India.